Here's Motley Fool contributor Emil Lee's second half of his interview with superinvestor Mohnish Pabrai. Click http://shamgad.blogspot.com/2007/02/mohnish-pabrais-perspectives-on.html for Part 1. Emil Lee: How do you do your due diligence? Do you generally stick to industries you are already familiar with? How in-depth do you get, in terms of studying a company, its industry, and its competitors? Do you talk to a lot of people in the industry? Mohnish Pabrai: I don't call or meet with management or company insiders. I do rely, from time to time, on the investors in Pabrai Funds. I am blessed to have a large contingent of CEOs and entrepreneurs as investors. Many of these folks know their industry cold. So, if I'm looking at something in real estate, there are [a] few real estate experts in my circle. I read up on the business, try to honestly assess whether it is within my circle of competence, and then send my thesis to the investors with domain knowledge and get their perspective. Lee: You don't use Excel models. How do you keep track of all the moving parts (i.e. unit costs, discounted cash flow)? Are the economics of your investment ideas so compelling/simplistic that they can be done on the back of an envelope? Pabrai: Usually two to three variables control most of the outcome. The rest is noise. If you can handicap how those key variables are approximately likely to play out, then you have a basis to do something. Things that are approximate and probabilistic don't lend themselves too well to Excel modeling. For me, if I find myself reaching for Excel, it is a very strong sign to take a pass. The thesis ought to be painfully simple in your head. Lee: There's a ton of books about value investing, but very few about "special situation" or "event driven" investments -- do you recommend any books/magazines? Do you recommend any other business publications/trade magazines? Also, you mentioned Timothy Rick in Altucher's book -- I couldn't find anything on him (was it supposed to be Timothy Vick?) -- can you point me in the right direction? Pabrai: Yes, it's Tim Vick. Buffett has spoken and written a lot about special situations. 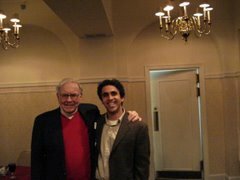 One should read up on the Buffett Partnership letters and Shareholder letters, as well as the annual meeting transcripts printed in OID. Tim talks about it in his book as well. Finova was a recent Buffett Special Situation, as were his adventures with Level 3 (Nasdaq: LVLT) Bonds, Korean stocks, American Express (NYSE: AXP) in the 1960s, etc. Lee: What do you hope to accomplish with your new book? Is there a message or point you'd like readers to pay particular attention to? Pabrai: The best way to learn is to teach. Writing the book was tremendously helpful for me to systematize the framework that I had in my head. I enjoyed writing it. I wrote it for the intelligent individual investor. And I wrote it for the great-grandkids that I'll probably never meet. If it improves the investing results of a few humans, I'd consider it a success. Lee: Do you have any additional advice that would be helpful to people like me, who are trying to learn as much as possible about investing? Pabrai: Pursue your passion, whatever it is. If you pursue what you love, you're pretty much assured of doing well at it. If investing is your passion, then study the best intently. The best investor is Warren Buffett and he's an open book. I'd suggest spending all one's energies getting to understand Buffett's modus operandi. To the extent that it's consistent with your temperament, adopt it. 1. "We will treat your investment...as if it were our own." 2. "We will remain significant investors with you..."
We have no view on what markets will do, but this environment presents a challenge as we enter 2007. There are few available bargains as we look for new opportunities to strengthen the foundation for compounding over the next five years. The domestic “on deck” list of potential investments is relatively small, but we are buying several new international companies. Spoken like a true creator of long-term value. Emil Lee: You've modeled your partnership after the Buffett Partnership -- do you mind providing any detail on how that's going? Are you on track in terms of performance, assets under management, etc.? Mohnish Pabrai: It has gone far better than I would have forecasted. Mr. Buffett deserves all the credit. I am just a shameless cloner. A $100,000 investment in Pabrai Funds at inception (on July 1, 1999) was worth $659,700 on Dec. 31, 2006. That's seven and a half years. The annualized return is 28.6% -- after my outrageous fees and all expenses. Assets under management are over $400 million -- up from $1 million at inception. On all fronts, Pabrai Funds has done vastly better than my best-case expectations. Going forward, I expect we'll continue to beat the major indices, but with just a small average annualized outperformance. Lee: You clearly believe in having a broad latticework of knowledge from different educational disciplines from which to draw upon when judging investment ideas. Can you describe how you spend your day? Do you devote a general percentage of your time to reading "non-investment" material versus 10-Ks, etc.? Pabrai: My calendar is mostly empty. I try to have no more than one meeting a week. Beyond that, the way the day is spent is quite open. If I'm in the midst of drilling down on a stock, I might spend a few days just focused on reading documents related to that one business. Other times, I'm usually in the midst of some book, and part of the day goes to keeping up with correspondence -- mostly email. I take a nap nearly every afternoon. There is a separate room with a bed in our offices. And I usually stay up late. So some reading, etc., is at night. Lee: In Trade Like Warren Buffett, you mention that you let investment ideas come to you by reading a lot, and also monitoring familiar names on the NYSE. Can you describe your process of generating investment ideas -- is it simply just reading a lot? Do you do anything else to actively seek out ideas? Between all of the above, I have historically found at least three to four good ideas every year. Sometimes I make a mistake, and a good idea turns out to be not so good. Lee: A big part of investing is knowing what to pay attention to and what not to [focus on]. How do you sift through the thousands of investment ideas? Often, bargains are bargains because they're unrecognizable -- how do you spot the needles in the haystack, and how do you avoid the value traps? Pabrai: I wait to hear the scream. "Buy me!" It needs to be really loud, as I'm a bit hard of hearing. Lee: Would it be fair to say you are more balance sheet-oriented, versus income/cash flow statement-oriented? If so, how do you get comfortable with the asset values (i.e., Frontline, death care)?